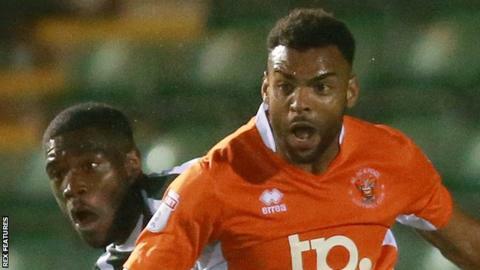 Blackpool boss Gary Bowyer says defender Curtis Tilt will not play at League One level for long as he is too good for the third tier. Tilt, 26, joined from Wrexham in June, having never played full-time football. "The rise of Curtis has been phenomenal. He's learned a lot about himself," Bowyer told BBC Lancashire. "The amount of training, knowledge and information he's been given, he's done well to take it on board and produce the level of performances that he has." When asked if the former AFC Telford United and Hednesford Town man would play in League One for long, Bowyer said: "Not at all, with the level of performance he's got. With his pace, I think we've seen once or twice that he's unbelievable." "He's playing on the opposite side and his potential is enormous - for me, he can go as high as he wants." Bowyer also believes Tilt's defensive teammate Clark Robertson can potentially play higher than the third tier of English football, after a string of fine performances this term. "With Clark what you have got is a very cultured ball-playing centre-half who is developing that side as well," Bowyer continued. "His progress is massive. He is the same as Curtis. He has the potential to play higher than League One."